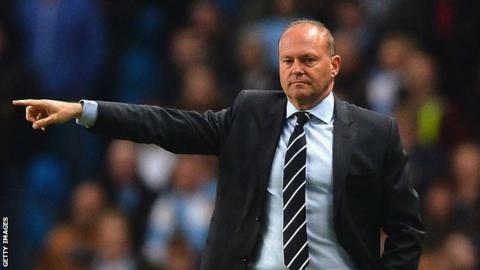 West Brom head coach Pepe Mel says his contract expires this summer - but hopes to hold talks about staying on. The former Real Betis coach signed an 18-month contract when he replaced Steve Clarke in January, according to the West Midlands club. But Mel said: "My contract finishes after the Stoke City match and then we will have the meeting for the future." The Baggies need just one win from their three remaining fixtures to retain their Premier League status. It's easy to understand; if Pepe Mel says yes and West Brom say yes, no problem. They travel to Arsenal on Sunday, then Sunderland on Wednesday followed by a home match against Stoke City. Mel added: "I will have a meeting with West Brom after the season but the next important thing is Arsenal on Sunday. "Of course we can bring the talks forward when we are safe. We can talk about the situation on Monday if we are safe." Asked to clarify the situation regarding the length and nature of his contract, Mel said: "It is an open contract. It's not closed, the contract. It's easy to understand; if Pepe Mel says yes and West Brom say yes, no problem." The 51-year-old admitted his introduction to the Premier League was tough as he dealt with the sale of striker Shane Long to Hull City, the Nicolas Anelka 'Quenelle' saga and a long wait for a first victory. "I enjoy my job, being at West Brom and the fans," he said. "But January and February were very, very difficult for me. "But the most important thing is at the end. If at the end it's good, then no problem."